Contrary to earlier reports of a clunky looking squared Windows Vista Media Center remote showcased at Digital Life 2006 by Neowin.net (via PVRWire), the official Windows Vista Product Guide, recently updated for RTM, (via StealthPuppy) showcases a much newer and aesthetically pleasing design for the remote. Could this be the real one? It looks hooooooot, although the center “OK” button looks like if it’s straight out of OSX. The embedded filename for this picture is clearly labeled “MCE_Vista_Remote” on page 159 of the Word document. I’m going to put my money (not that I have any) on this as the real thing! Update: The new remote design is confirmed as only a prototype. It may/may not be the final generic Windows Vista Media Center remote. Wow, it does look good, hope it’s real, I’ll take one! Well, I hope they would change the logo on the Green Button for the Windows Vista flag, and not this old XP flag. It’s just nicer looking. I guess I’ll be replacing my current MCE Remotes with this puppy when it comes out. That remote was shown at Mix 06 too. I’m hoping it’s going to be aviailable next year. It’s a very nice looking remote. @Atomsk: i thought the vista mce remote would have sideshow as well. there was another mce remote i saw in a channel 9 video, with sean alexander using a smaller remote. it was practically flat, and didn’t have the teletext buttons on the bottom, much like a regular dvd player remote and possible power by a cr2032 or something. i thought that was a prototype for the next mce remote. sidenote, i hope they decide to go ahead with that live services front end for media center. This is great news since my next PC (January or February) will be in my Living Room and built around movies, photos, music! I doubt it’ll be the final one released, since the logo inside the green orb looks the same as the Windows XP logo. haha, that was really random. I don’t really like either of those:s hope the actual ones look nicer! I don’t expect much from a low-cost remote control, but I would have hoped for a distinct TV power button in addition to the power button shown. This was my number one gripe with the XBox 360’s remote power button configuration and the sole reason that I use an old MCE 2005 remote for controlling my media center experience on my 360s. Logitech probably just loves it when there are glaring oversights like this. Black and grey… interesting choice considering Media Center is as blue as you can get and Vista is all about transparency. I would have thought something more glossy would “match” Vista. Looks nice tho. I don’t mind the old MCE remote except for the fact that the damn number buttons (and the DVD Menu button etc.) don’t light up! Anyway, I’ve long since ditched Vista’s Media Center. I had such high hopes for it and stuck with it through RC1 and RC2, it is just so featureless when compared to something like XBMC or Media Portal (my current Media Center which works a treat on Vista and utilises the MCE remote). That is a sweet looking remote! 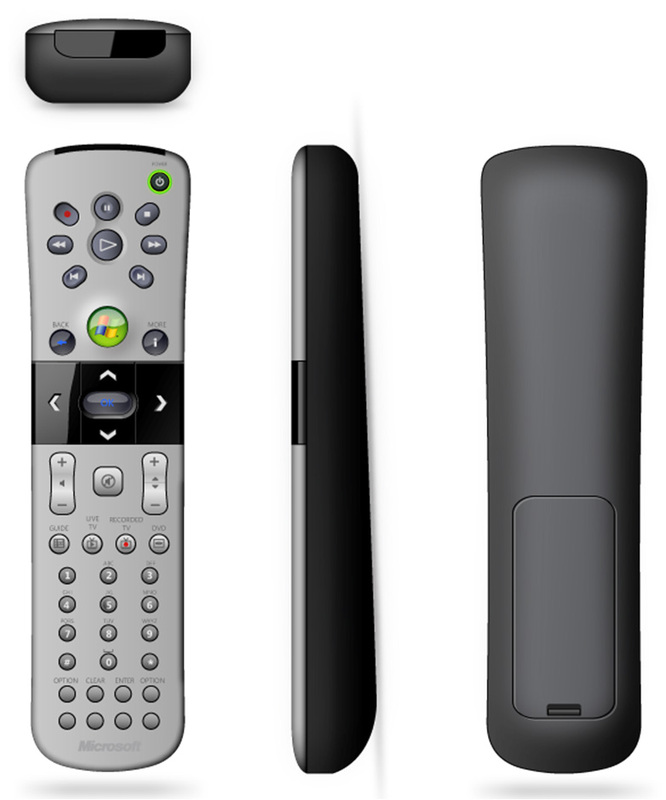 I particularly like the design, which places the majority of the weight (or feel) in the bottom half of the remote. No doubt it will be the same as XP MCE. It will launch Media Center if it isn’t open and if it is, it will take you back to the main screen. The windows logo button starts media center like it has for 5 years. No TV Power Button ? must be a mock, those 4 blank buttons at the bottom? I still think this was designed by an engineer, the mapping in the hand does NOT look natural. The current remote has way too many buttons as it is! Looks like that initial remote is one from Phillips. With the whole voice recognition, that is now built into Vista, what is the use of a remote? You can do everything simply by talking to your machine, as crazy as that sounds. This is now two years down the road, but i’m having a hard time finding “Microsoft” Media Center Remotes. I see a few on fourth or fifth tier sites that i don’t trust, or third tier with the price as high as $70+, otherwise on Ebay for the AO9-00007 (older original curvy style MCE remote). I used the link above from Shahn and found the remote that’s pretty much the same with out the two tone color sceme, but yet searching google for the many product numbers from their or others i found online pulled up less than the old AO9-00007 & 9 versions. I want original “Microsoft” but ??? i’m just not seeing them, which seems very strange to me given the number of people like me that bought & built Vista Premium or Ultimate systems with the TV tuner cards.??? I’m not seeing any of these new ones mentioned in this article ? At stores like Newegg, Buy com, ZZF etc. Anyone know when this is scheduled to be released? I would love for this to be released, but I don’t think it will be. Its been too long to be released now.